It is always the weather which can make or break your trip. 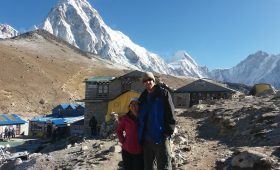 If you are dreaming to trek Everest Base Camp, you must know that different weather different experience at EBC. Nepal’s diverse topography: – starting from plain southern region to mid hill and northern Himalayan rage are the masterpiece creation of nature. The different geographical structure and altitudinal difference creates different climatic conditions. The most popular Everest Base camp has extreme climatic conditions. The short changing and fluctuating weather makes it dramatic and adventurous place to visit. It is chilly cold from the end of November in the northern hemisphere of Nepal. Despite the extreme weather, it is still possible to trek Everest Base Camp. It is said that the mountains are at its best attire in winter. 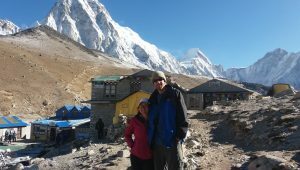 If are geared up with proper equipment, you will be have an excellent Everest Base Camp experience in winter. The winter invites strong clod winds and occasional snowfall in Everest region. The snow embellishes the majestic peaks and some part of trails. Very few trekkers visit Everest Base Camp in winter: making it a solitary trail. The Days are usually sunny but a freezing night might not be suitable for every travelers. The temperature falls dramatically down within a day. Travelers must be prepared to cope the fluctuating weather. A snowy trail might lead the travelers, so it is wise to accompany a professional Sherpa guide. Spring is the second best season to trek Everest and other mountainous part of the country. The month of March – April and May ensures a stable and “trekking-friendly” weather. You can expect 7 hours of sunshine with precipitation of 15mm per month. There is very rare chance of rainfall; thus the humidity is also low and daytime temperature is warm. But, nights and early mornings are still cold. In spring, you will encounter a huge traffic along EBC trail; better book the hotel and flights in advance. The sky in spring is clear with un-obstructed views till late afternoon. In addition to clear mountain views, you get privilege to enjoy a lush vegetation and different species of flowers. A blooming rhododendron flowers are blanketed all over the hills: offering you a delightful experience. Moreover, this season is equally favorable for nature lower: take you time to discover variety of highland birds and animals in Sagarmatha National Park (a USESCO protected site of great natural values). The month of June – July and August is summer in Nepal. The country receives frequent coming or non-stop rainfall in summer. Due to monsoon, the trail in Everest region is going to be wet. The season is considered as less favorable time to trek Mt. Everest Base Camp due heavy downpour and cloudy weather. Add to this, monsoon invites potential threat of landslides and floods in lower reaches and the risk of avalanche in the higher reaches. Moreover, the itchy leaches all over the forest trail might be annoying for some trekkers. But if you are keen botanist, summer opens the door of survey: as different species of flora and fauna thrives in this season. Most of the teahouse in Everest Base Camp route are shut in summer. So do check the availability of teahouse before heading for the journey. 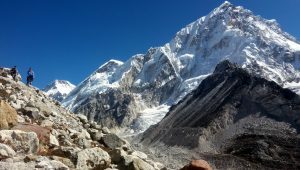 Everest view trek might be the best alternative to Everest Base Camp Trek in summer. Autumn is the most popular and crowded time of the year for Everest Base Camp Trek. It is indeed the perfect time to head for this journey. You can expect a clear, stable and trekking-friendly weather in autumn. Sky is deep blue with outstanding views. You can get opportunity to witness amazing landscapes and mountain views throughout the day. Having a clear weather does not mean that Everest Base Camp Temperature in autumn is warm. But it is not too cold either. The temperature is moderate; making a comfortable time to trek. But obviously, the temperature at higher reaches of EBC is lower in that of the lower reaches. Since, autumn is the peak season to trek Everest; we suggest you to book the accommodation and flight in advance. Also get ready to discover the large crowd; even in remote areas. But the large does not indicates hundreds and thousands. It means; you might not find solitary; which have been imagining amidst of mountains.